Learn more on cooking and eating locally in Kristin’s blog The Intentional Minimalist. 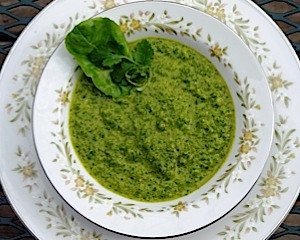 See this recipe in the featured article Northern Michigan Recipes: Fresh Chimichurri for Mother’s Day. Remove skins and chop three large garlic cloves and place in glass base of food processor. Remove seeds from one large jalapaeno and add to food processor. Zest lime and add zest to food processor. Juice lime and add juice to food processor. Pulse food processor for thirty seconds. Remove two cups baby white swiss chard from stems, chop and add to food processor. Remove one cup cilantro leaves from stems and add to food processor. Add three tablespoons cilantro lime jalapeno olive oil, one eighth teaspoon smoked paprika and one eighth teaspoon sea salt to food processor. Taste and adjust seasonings and oil as desired.